I had a ridiculous moment in the car on the way home from work on Friday. 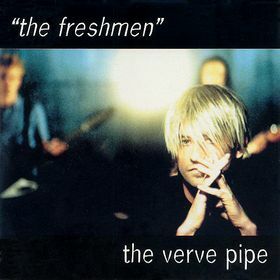 The Freshmen by The Verve Pipe was on the radio. If you're not familiar with the song The Freshmen, and since you weren't a teenager in the 90's there's a good chance you're not, it is an overwrought ballady barf of a song about some teenagers who didn't take some advice and then one of them dies, or something, and at some point in a made up future the singer is wailing about how innocent they were, and how it wasn't their fault because they were MERELY FRESHMEN!!! HEYEEEEEAAAHEEEAAEEEAAAEAAEAAEAOOOOOHHHEEEAAEAAEAHH!!! We all had this haircut in the 90's, and none of us smiled. Anyway, I love that song. I love it because it takes me back to a very specific point in my life, where I too was innocent and nothing was my fault and things happened that seemed much more important than anyone besides me thought they were, and I couldn't control them, and that really upset me because we WERE MERELY FRESHMEN!!! HEEEYYAHEAAEAEAAEAAEAOOHHEEAAEAEAAEAAEAAAH!!! So there I am, singing along to this wonderfully awful song, and the strangest thing happened. I thought of you and started tearing up a little in the car. Not two-year-old you, fifteen year old you. Why? Well, I started getting teary-eyed because I realized at some point during the second chorus that I had almost completely forgotten how incredibly hard it was to be a teenager. The stress and anxiety of those years hadn't touched my thoughts years. I am forgetting. And while some magical combination of perspective and senility has probably afforded me this wonderful gift, which I can only describe as "content happiness", it is tinged with sadness by the fact that by the time you reach your teenage years, I will have probably completely forgotten what being a teenager really felt like. So before that part of me fades away completely, I join the Republican party and spend the rest of my days talking about how good, kind, and respectful everyone was when I was younger, please allow me a few minutes to let you know that I, too, was once where you are, and I ,too, was lonely. Then I'll tuck this letter away in the blog and someday you can pull it up on your iPillow and read it just before you cry yourself to sleep because you're sad about some incredibly important thing that future-me will not think is important in the slightest. So here you go – a letter from your dad while he still barely remembered what it was like to be a teenager. You know that thing that is going on that you think is the most important thing to happen in the history of you… or even of the world? You know, the one that has your stomach all balled up and tears leaking out from your eyes every time you tilt your head the wrong way? It's that problem that has everyone telling you that they know how you feel because they've experienced some bastardized form of said problem, and if you just give it some time everything will feel better and you'll look back on it and laugh. I need you to know something. It is the most important thing in the world, and knowing that someday you may or may not care about it isn't going to make you feel any better. Perspective is only valuable once you have it, and right about now your perspective is telling you "f*ck perspective". I'm on board with that. Because whether something is the end of the world, or it just feels like the end of the world, it still FEELS LIKE THE END OF THE WORLD! Here's the hard part for me, not only can I not fix that thing that is eating you up inside – I'm probably too old and detached from what you're going through to even understand it. Old me is going to look at you, and tell you I love you, and you're going to scream at me that your life is over and that I will never understand, and you're right about at least half of that. I probably won't ever understand you. But I did once. I promise. I parked my car in an alley once and screamed at the top of my lungs while repeatedly slamming my fists into the steering wheel. I sat, balled up, on the floor of my shower one time and cried until the water was ice cold. I wrote poems for girls. I dreamt of being liked and being popular and getting the part in the musical or the position on the football team. I longed for those I couldn't have and lost those who I did. I went through long patches of my life where I felt immensely lonely. And every time, I didn't know if it was the end of the world or if it just felt like it – and I didn't care. And it was only made worse by the fact that my awesome and loving parents just didn't get it. And now I'm the parent who doesn't get it. So I'm sorry. I'm sorry that future me doesn't understand. 2013 me does. Maybe in the future you'll be able to upload a hologram of 2013 me and tell me about how much of a douche bag I've become. I'll compliment you on your laser hair and you'll complain about how future me hates that it cost $4,500 dollars. Then I'll go to give you a hug, and you'll go to hug me back and you'll fall on the floor because I'm a hologram. We'll laugh a little and that will make hologram-me happy, or at least appear happy since I most likely won't have emotions - because I'm a hologram. Then you'll say good night, turn hologram me off, and switch your iPillow to the classic rock station where, I hope to god, The Freshman by The Verve Pipe is playing. Because, while future me may not understand what you're going through, The Verve Pipe always will. Being a teenager really is hard. I think about parenting our future teenagers with much trepidation. Thanks for helping me laugh about it (while shaking with fear). I know better than to read your blog when I'm at work. So why did I do it today? No answer. Glad I read it, but sorry I did it at work - no kleenex nearby, no handkerchief to blow my nose. I'm not a father, but I completely get what message you're sending to your daughter. I hope she reads it and softens a little bit during those moments when she feels that she hates you but she knows that she loves you. Aw dang. Good stuff Mister Dad. As a daughter who recently lose her daughter to cancer, I can say that, as long as you remember what it was like to be young, she'll see that and (someday) appreciate it. My dad wasn't perfect, that's for sure. But he certainly brought up a level headed girl. I remember my dad telling me (later on in life) that he's so grateful I didn't repeat a bunch of their mistakes, and that I skipped a few really annoying cheer-leader-wanna-be-high-pitched-girly-voice stages (which saved his sanity as well). He traveled for business, so he couldn't be there for a few moments that are special to a daughter - and exceptionally awkward for a father (like my jr prom, etc). But if there is one thing I can say, it was always quality time when there was time. You're investing in that now, through your blog, and through your life. It'll pay back dividends that will touch her life, and the lives of all that know her. If you've never read Franny and Zooey by JD Salinger, you might. Letters and journals play a huge part of the narrative and Zooey's older brother, Seymour, writes him a letter in which he says that He Was A Young Person Just Like Yourself Once. It always gets me. Stopped by to welcome you to Collective Bias and I loved finding this. Great mix of truth, humor, and raw emotion. I am pretty sure the song is about abortion :( its even sadder when you think about the lyrics in this way. If it makes you feel better I never really hd too much teenage angst as a girl - life was great and peachy keen as far as I was concerned. Much more angst being a mother! I am almost certain the song is about how the guy and his friend were both sleeping with the same girl and then she committed suicide. I think I heard an interview with the Verve Pipe (when I was a high school freshman in Michigan)on the radio- they were also from Michigan, I think they went to Michigan State. This reaffirms my delight in remembering how awesome and perfect I was as a teenager, because I never struggled with any of these issues! And since awesomeness is hereditary, neither will my kids. Good luck to your, though!